In honor of April as National Poetry Month, the City of New York sponsors the annual Poem in Your Pocket (PIYP) Day. During the month and on PIYP Day, schools and cultural organizations across the five boroughs host poetry readings, conduct writing workshops, and organize other activities celebrating poetry. The Office of the Mayor, in partnership with the New York City Departments of Cultural Affairs and Education, initiated the annual City-wide PIYP Day celebration in 2003. PIYP Day provides an opportunity to showcase talented faculty and student poets in our schools, and encourage New Yorkers to embrace literacy and poetry. 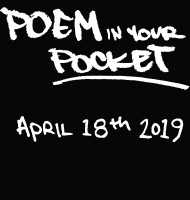 In 2008 The Academy of American Poets took Poem in Your Pocket day national, allowing people around the country to channel their inner bards. The Academy also published Poem In Your Pocket, an innovative book that allows you to select a poem you love, tear it out, and then carry it with you to read, be inspired by, and share with coworkers, family, and friends. The Bryant Park Corporation hosts an annual Poem in Your Pocket Day Poetry Slam for New York City public schoolchildren in the Bryant Park Reading Room. Metro New York publishes the winners of the #PoetweetNYC contest along with poems and other literary content from local public officials. The Poetry Society of America presents a variety of annual poetry programs. Be sure to browse the PIYP Events Calendar to find poetry programs for audiences of all ages throughout April and on Poem in Your Pocket Day, and look for new updates on the Poem in Your Pocket Facebook page.